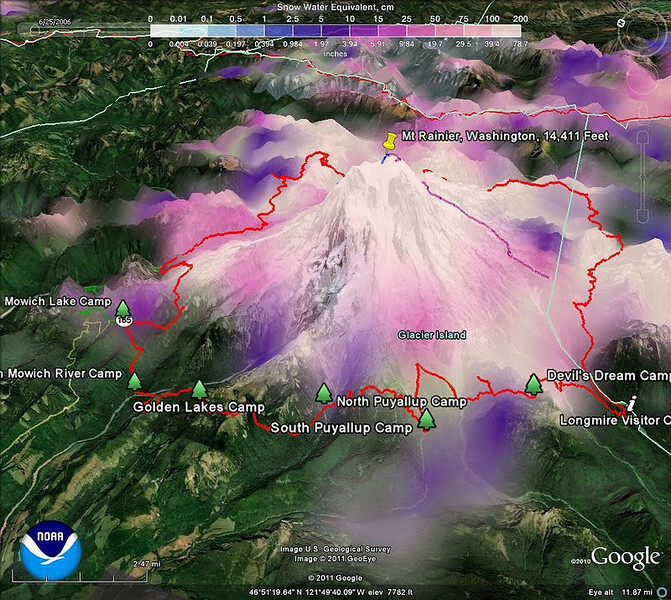 Around January 2011 we started discussing a full family backpacking trip for the summer. Gina and I really like epic loops like the Tour du Mont Blanc so the 93 mile Wonderland Trail around Mt. Rainier in Washington was a natural choice and had been on my list for a while. I was imagining a full backpacking and “wilder” version of the Tour du Mont Blanc. Making the decision to do it turned out to be the easy part. Because you must camp in designated sites, and there are precious few of them along the trail, the NPS has a permit system that you must use. Altogether there are 18 backcountry camps with 2-7 sites at each (most have 3 or 4). A site is basically a flat spot that you can hopefully squeeze two small tents on. Each camp is equipped with a bear pole — a roughly 12 foot pole with wire struts at the top to hang your “smellables” on at night or when you step away from your camp. The intent is to keep food and anything else with any hint of an odor (sunscreen, toothpaste, etc) out of the reach of the bears which frequent the trail and camps. They also have a wood box with a seat, a.k.a. the toilet, which sure beats digging a hole in the ground. Some are just out in the open (leave modesty at home) and others have a strategically placed short wall to avoid getting to know your fellow hikers up close and personal. A few even have real walls. To get reservations, you apply in a window from March 15 to March 31 with a desired itinerary (i.e. camps you will be at on specific nights) and they draw applications in a lottery to decide who gets to go. Some members of our families questioned if having your name drawn was considered winning or losing. We submitted our application and anxiously awaited word on our fate. Word came around April 21st — rejected because the sites we asked for had already been allocated in the window of time we requested! Kyle needed to be back at school on August 20th so our window was constrained. After some frantic phone calls, a wonderful ranger named Sarah worked with us to get a manageable itinerary by starting on July 23rd and having a 3 day layover about 3/4 of the way through the trip. Not ideal but we had reservations! One of the nice things about the Wonderland Trail is that you can mail food caches ahead to 3 roughly equally spaced locations around the park. 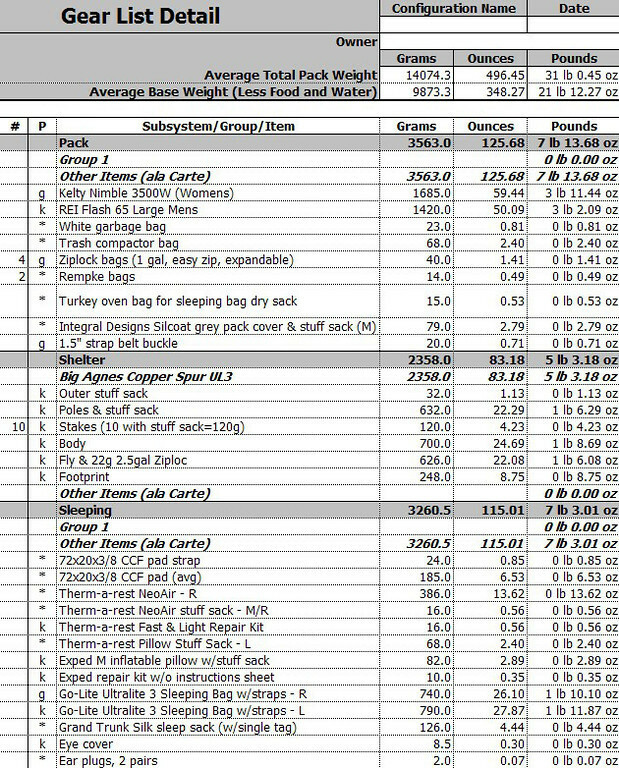 Our itinerary started at Mowich Lake so we planned to send caches to White River and Longmire to pick up about every 4 days, thus reducing how much food we would need to carry. We went with a simple “freezer bag” menu — basically a variety of dehydrated foods that we could just add hot water to in a Zip-Loc freezer bag. We each had our own menu variations with a target of 100-125 calories/oz. After figuring our pack weights, I opted to leave the DSLR at home. In hindsight it would almost have been worth bringing given the weather and incredible scenery. Probably would have slowed our pace down though due to the numerous picture stops. Instead I brought Gina’s little Canon SD1300 with 2 extra batteries, several memory cards, and a neoprene case. The entire kit weighed less than my lightest DSLR lens and fit in my pants pocket. Downside – picture quality took a big hit and with very limited battery I did not spend much time on careful compositions. I really suffered as a result on the trail and everyone probably got sick of me saying “I really wish I would have brought my good camera”. Over the next few months we acquired gear for the boys, planned all the details, and then waited for the snow to melt. And waited, and waited. Turns out Rainier had a ridiculous amount of late spring snow this year and the annual melt-out was running at least a month behind. To give you an idea of the annual snowfall, the Paradise area that we would pass by is the snowiest place on earth where snowfall is regularly measured (see the NPS website for details). The annual record is 93.5 feet in 1971-72 and the average is 52.5 feet. The normal season for the trail starts mid-July when most of the lower elevation snow has melted, i.e. we were scheduled to start about as early as most people would want to attempt it. By July 11th, it was obvious we were in trouble with our start date as the trail was considered impassible, most camps (and most of the trail) were still under snow, and the rangers were saying with one exception, no one had made it more than 1 night before turning around. We made the painful (and expensive) decision to postpone our flights to 7/31 and lose our precious reservations in hopes we could get a “walk-up” itinerary that started on the South (rather than North) side when we arrived. Even then it was not clear we would be able to do the trail so we had to scramble and plan some last minute alternatives. We made last minute purchases of Kahtoola MicroSpikes, Rocky Gortex socks, and some CCF pads in case we had to camp on snow. On 7/31 we boarded a plane unsure what we were in store for. Since we started at Longmire, which was going to be a cache pickup point, the first thing we needed to do was retrieve our food cache and load the contents into our packs. After we postponed, we had to scramble and send a third cache to Mowich Lake. In our jubilation that we were able to get a revised itinerary, we forgot to ask for our cache buckets — and the backcountry office closed at 5:00. By the time we realized the mistake the rangers were all gone which was a show-stopper for starting that night. We frantically looked around and after knocking on the museum door an intern asked what we needed. 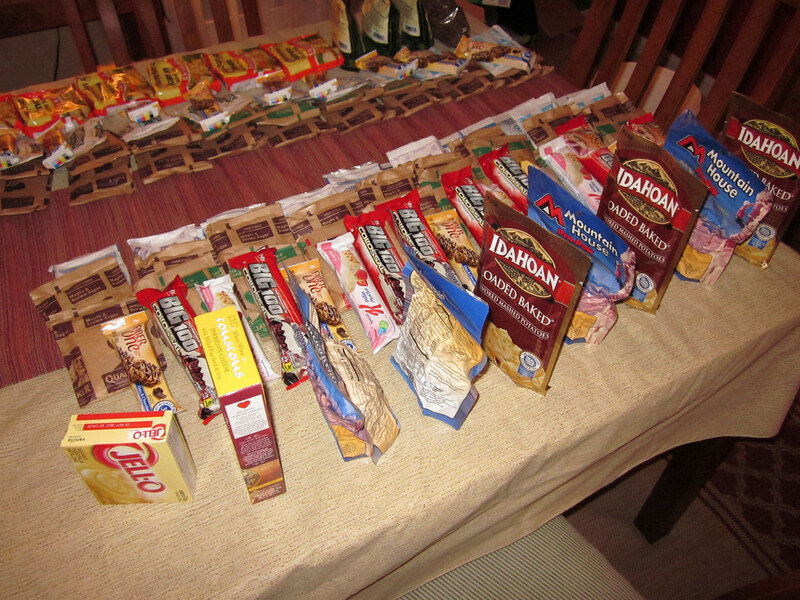 Fortunately he had the keys to the backcountry office and was able to get our food caches. This wound up being perhaps our best adventure yet, especially since we were doing it with the boys. It was certainly not without its challenges, although if the snow were removed, it would actually not have been too bad (Gina has a different opinion). We only had one blister (Kyle) and one sore knee (Ryan). We had perfect weather and I think we saw the mountain every day. We did not have a drop of rain the entire hike! Altogether we hiked 97 miles (due to having to backtrack and do an alternate route from one camp) and ascended 22,992 feet (and descended 22,992 feet as well!). When we finished and checked in, the rangers said only a few dozen people altogether had completed the trail this year. Pictures do not even begin to capture our journey but we hope it gives you taste of the incredible experience known as the Wonderland Trail. 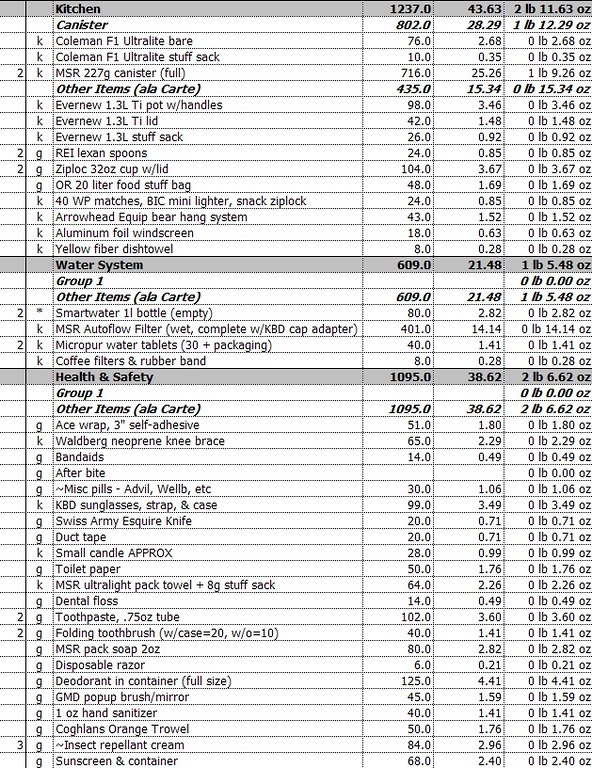 For those curious about exactly what we took, below are our gear list details along with a snow map showing the trail conditions a few weeks before we started. 9 days worth of food for Keith and Gina. Keith’s vacation rule – if you don’t lose weight, you did not have a good enough time! Two weeks before our trip, snow still covered much of the trail. 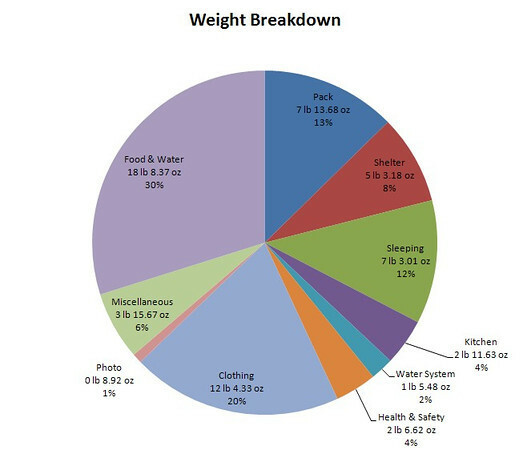 Breakdown by category of our weight (sum of both our packs). Gina did not actually carry more than me — The boys and I would usually be carrying a substantial part of the food weight and I would usually carry the water so her actual weight was more like 22-25 pounds and mine in the low 30s right after hitting a food cache. 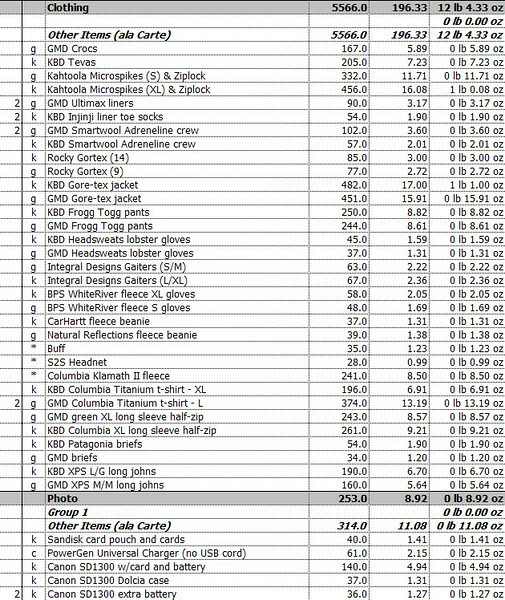 Keith and Gina’s gear list. 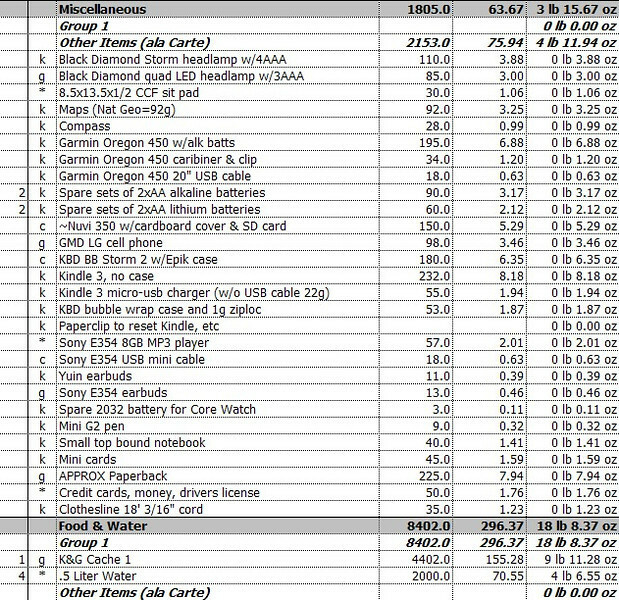 The # column is the quantity and the P column is who will be carrying the item – c means it was left in the car, * means each of us carried one of the item. Clothing does not include our basic clothes worn – a short sleeve shirt, convertible pants, underlayers, socks, and boots. Note Gina snuck an extra shirt in… contraband alert! Food & water weights are worse case – 2L water each and the heaviest load of food.